Meet the future Dr. Chelsey Lufkin. When I first met Chelsey it was during my third year of veterinary school in junior surgery. Junior surgery can be somewhat terrifying to some, but if you had Chelsey as your instructor, she put you right at ease. She was a great instructor, with an awesome personality to boot. Why am I highlighting Chelsey this month? Because she has an awesome story about her journey leading to veterinary school. Chelsey grew up in Forney, Texas (also a plus that she is from Texas). She played volleyball, golf and tennis in high school, but was more interested in the National Honors Society than sports. Growing up, she remembers begging her parents for a medical kit so she could play “human doctor.” Her interest in the veterinary side of medicine didn’t come until she was in high school. She needed a part-time job so she began working for one of the local veterinary clinics as a veterinary assistant. That was the moment, the moment she decided this is what she wanted to do for the rest of her life. The veterinarian she worked for at that time was a DVM graduate from Oklahoma State University and encouraged Chelsey to go there. Chelsey visited OSU and fell in love with the town and the school. Much like I did! Chelsey pursued a Bachelors in Animal Science and did very well. 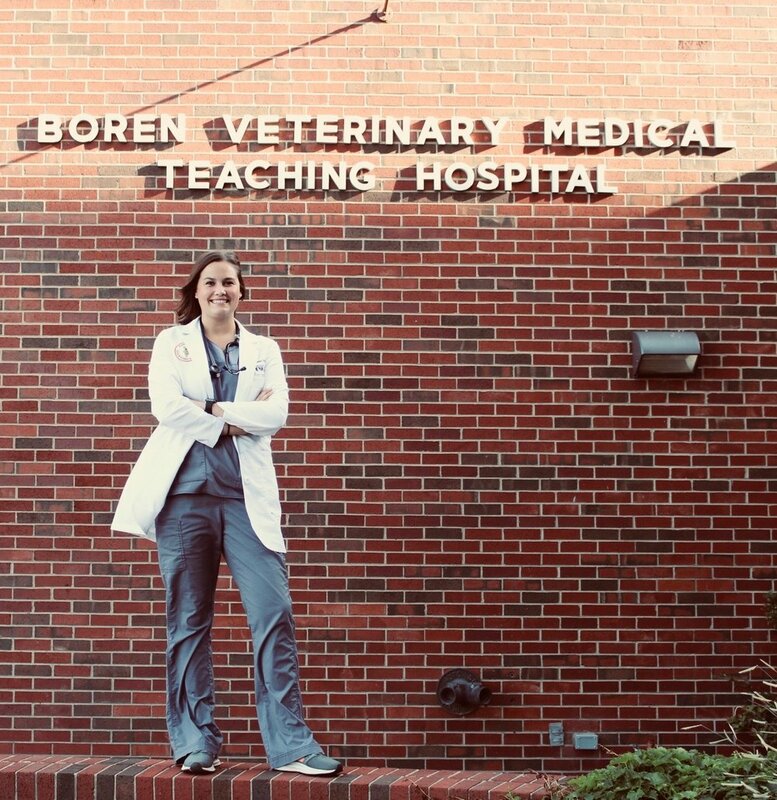 She took a leap of faith, laid everything out in her application, sent up some prayers and applied to veterinary school. Sometimes, life doesn’t always go as planned and Chelsey received the devastating news that she did not get accepted. Her heart was crushed. Her dreams were crushed. She felt like giving up. Many people at the time told her to find a “Plan B” for her life. They told her with her grades she would NEVER get in and she should find something else to do. Mom to the rescue! Her mom was VERY supportive and basically told her not to listen to those that tried to tear her down and strip her of her dreams. And it is a good thing Chelsey didn’t give up because she did eventually get in. Chelsey was considered an out-of-state student at the time of her first application. She was advised to find a job in Oklahoma and gain residency and apply as an in-state student. This was also a challenge. She looked and applied at many different veterinary clinics. It seemed, at first, that this was going to be another road block with few jobs available. That is when OSU’s Shelter Medicine Department called Chelsey and offered her a job as a veterinary technician. Shelter medicine is a cool part of the OSU Veterinary Hospital. Various animal shelters around the community are set up to bring in animals every week for the veterinary students to learn procedures (spays/neuters). Chelsey would be a veterinary technician helping to shape the future careers of third and fourth year students. Chelsey worked in Shelter Medicine for two years and applied again to veterinary school. This time, as an Oklahoma resident and some killer recommendation letters from professors/clinicians in the program, she was granted entrance! Chelsey says that she will never regret or take back her time as a technician in shelter medicine. She was able to have direct contact with the veterinary students and learn from them as well. The students shared some of their experiences with her daily and this just reaffirmed, for her, to continue to pursue her dream. Chelsey said her first year was super stressful for her. Believe me, I understand! She was constantly stressed. If she wasn’t studying and saw other students studying, she would go study. There was never a moment she just sat back, took a breath and relaxed. Worrying about grades was a constant reality especially when she overheard conversations about academic excellence from her peers. As she moved onto her second year, she decided that “I can only do as well as I can.” She took more time away from studying and focused on her friends and her dog. She believes, by taking this step back, her overall well-being was much better and funny thing … her grades improved! And of course, she loved third year, because this is the year you bring everything together and start putting it into practice. She also excelled in small animal surgery! No surprise there. If this is what you want to do, do it! Set up a “mock interview” before your actual interview for veterinary school. During veterinary school, remember how lucky you are to be there! Some students never get the opportunity that we have been given. Don’t worry about timelines. Sometimes things don’t work out the first time. What are Chelsey’s plans after veterinary school? She is headed back to the big state of Texas. The sky is the limit for this awesome fourth year. She is keeping an open mind about the practice she wants to start in. Emergency small animal medicine and general practice however are at the top. In the future, she hopes to expand her knowledge and passion for shelter medicine with an ultimate goal of providing foster care to geriatric patients.